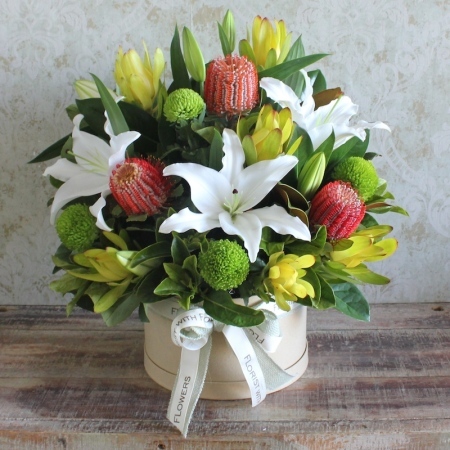 A beautiful Christmas display of Leaucadendrons,White Oriental Lilies and Banksias, delivered in a natural brown hat box makes a long lasting gift! Say Merry Christmas with flowers, what better way to send some Christmas cheer than with a stunning flower arrangement from Florist With Flowers. Why not make this gift extra special by adding a lovely Ecoya candle, box of chocolates or a bottle of Australian Wine. Order flowers online this Christmas.